The top American commander in the Middle East, General Joseph Votel, yesterday branded Iran as the “greatest long-term threat to stability” in the region and called for steps, including military action, to disrupt and undermine Iranian influence and activities. Such use of military force would constitute an act of war, destroy the international nuclear deal struck with Iran in 2015 and set the Middle East on the path for another disastrous conflict. The hypocrisy involved is staggering. US Central Command has been the military instrument for the illegal US-led invasion and occupation of Iraq and Afghanistan that devastated both countries, led to millions of casualties and profoundly destabilised the entire Middle East. It is currently escalating a renewed war in Iraq and is enmeshed in the bloody US regime-change operation that has destroyed much of Syria, as well as military attacks inside Yemen. Votel accused Iran of wanting to be “the hegemon” in the region and being involved in “lethal aid facilitation,” the use of “surrogate forces” and cyber activities, among other things. Yet the US and its allies have provided billions of dollars in arms to its surrogates in Syria, and elsewhere, to foment a civil war to oust Syrian President Bashar al-Assad. Moreover, the aim of the criminal activities of US imperialism in the Middle East over the past quarter century has been precisely to ensure its own hegemonic role. Washington has long regarded Iran as the chief regional obstacle to its dominance in the Middle East. Significantly, Votel challenged the 2015 nuclear deal between Iran and the so-called P5+1 group—the US, Britain, France, China, Russia and Germany—that eased sanctions on Iran in return for severe restrictions on its nuclear programs. The general declared that the US had “not seen any improvement in Iran’s behaviour” and claimed it still posed “credible threats” through its “nuclear weapons potential” and “robust” ballistic missile program. President Trump in the course of last year’s election campaign denounced the 2015 nuclear agreement with Iran as “catastrophic for America, for Israel, and for the whole Middle East” and pledged to “dismantle the disastrous deal.” In a meeting last week with Iraqi Prime Minister Haider al-Abadi, Trump again openly questioned the deal and declared that “nobody has been able to figure out” why President Obama signed it. The alternatives now under consideration, as Votel’s comments make clear, are tougher sanctions, diplomatic provocations, covert operations and military strikes. In the US Congress, Senator Bob Corker hailed the bipartisan support last week for tough new sanctions against Iran in introducing the Countering Iran’s Destabilising Activities Bill that would effectively sink the 2015 nuclear deal known formally as the Joint Comprehensive Plan of Action (JCPOA). The legislation would brand Iran’s Revolutionary Guard Corp as a terrorist organisation and allow the re-imposition of sanctions on Iranian entities lifted under the JCPOA—a move that Tehran would undoubtedly regard as an open breach. Corker, who is chairman of the Senate Foreign Relations Committee and bitterly opposed the JCPOA, accused Iran on Tuesday of expanding “their destabilising activities.” Like General Votel, he listed the litany of grievances against Iran: its support of the Assad regime, the influence of Shia militias in Iraq and the arming of Houthi militias in Yemen. Iran’s “crime,” in other words, is to cut across the strategic interests of the US and its allies. Among the main charges against Iran is its collaboration with Russia in propping up Syrian President Assad and more broadly in the Middle East. General Votel specifically referred to Iran’s growing relationship with Russia as posing concern. Russia and Iran worked together closely and with the Syrian armed forces to inflict a humiliating defeat on US proxy forces in the city of Aleppo. In an unprecedented move last year, Tehran gave Russian war planes access to one of its air bases to carry out operations inside Syria. Iranian Foreign Minister Javad Zarif announced on Tuesday that Russia would be able to use the country’s military bases on a “case by case basis” in carrying out the air war inside Syria. Zarif was part of the Iranian delegation headed by President Hassan Rouhani that arrived in Moscow on Monday for talks on economic and strategic matters. Among the other deals concluded was an agreement for Russia to build two new nuclear power plants in the city of Bushehr, the site of its first power reactor. The growing ties between Moscow and Tehran are undoubtedly provoking deep resentment and hostility in Washington where it will further fuel the bitter infighting in the American ruling elite over foreign policy. US claims that Iran is destabilising the Middle East are matched by the denunciations of Putin and Russia for destabilising Eastern Europe, the Balkans and the world. 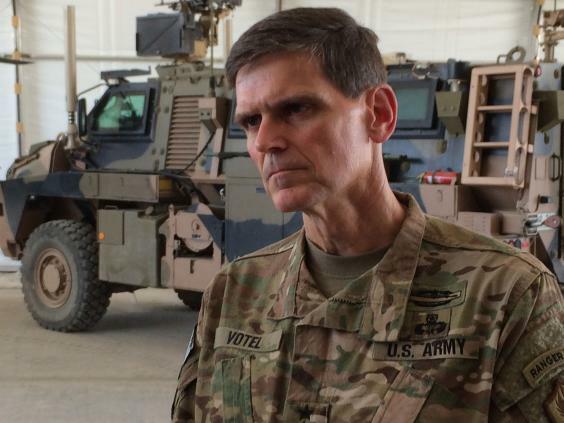 The reckless and provocative call by General Votel for the US to use “military means” to “disrupt” Iran threatens to provoke a conflict that would not be confined to the Middle East but would draw in other nuclear-armed powers like Russia and engulf the world.